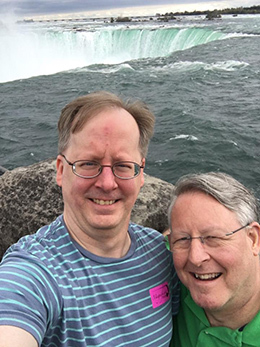 After spending several days in Niagara Falls and touring around Toronto – yay, Curiosa! 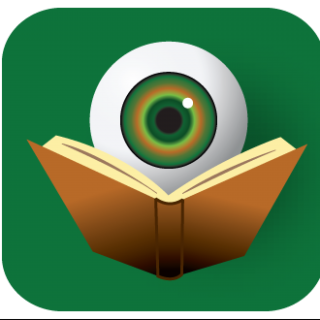 – we dedicated a number of hours to helping the wonderful folks behind the scenes at Bouchercon. We volunteered for the book bag stuffing task and it was as much fun as always. 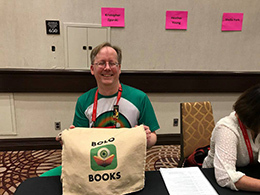 As always, these things could be a bit more organized – and this year was no exception – but the folks there are focused on making Bouchercon a success and all the volunteers are having fun – both working and mingling. This was followed by a delicious dinner at The Keg with my entire friend-clan who traveled up from San Diego (by way of other locations). My 2017 Bouchercon officially began with an evening visit to Noir in the Bar Toronto at the Rivoli. This was a great event to kick off the convention’s festivities. Admittedly, we didn’t stay for too long – as the morning’s festivities would arrive all too soon. But I was thrilled to hear a number of readers including Hilary Davidson reading a section from her story which will appear in a unique, new anthology. Serendipitously, BOLO Books had recently hosted the cover reveal for The Night of the Flood, so I was thrilled to get a tiny taste of what is a very anticipated read for myself. After that, it was off to bed for some restful sleep before the real madness begins. As has become a tradition of sorts, Thursday began with breakfast with some very special people. Michael and I joined Dru Ann, Judy Bobalik, Ann from Oz, and my friend Erin LaBonte-Mckay for a quick bite at Tim Horton’s (yummmmm) before we broke off to do our various things. 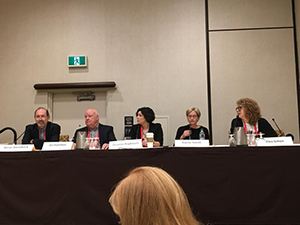 From there – after a brief visit to the bookroom – I popped into the Readers Recommend Panel where my friends Sarah Byrne, Janet Rudolph, and Aubrey Hamilton joined Robert Lopresti and Charles Salzberg in a discussion on their suggested reading lists (moderated by Carolyn Tillery). This was great fun and added countless titles to my reading pile. I was honored to have several of the panelists praise my work at BOLO Books. That was both gratifying and touching – not to mention appreciated! My next stop was the La Femme Cherche Panel. The topic was female sleuths and the panelists were: Ian Hamilton, Deanna Raybourn, Clea Simon, and Carrie Smith moderated by Steve Steinbock. This was one of my favorite panels of the weekend! Several of these are favorite authors of mine already and I was beyond thrilled to learn about Ian’s series – which I then went off to purchase. Anyone who doubts that there are kickass women both on the page and behind the writing in crime fiction need only to attend this panel to realize how wrong they are. Later that afternoon was my next volunteering gig. I was the room monitor for Shawn Reilly Simmons’ great Adapted For… Panel. 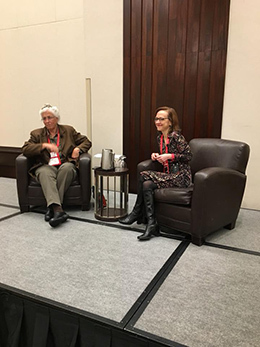 Talking about having their work adapted for other medium, writing screenplays, and other various topics were: Ann Cleeves, Lou Berney, Yrsa Sigurdardottir, David Morrell, and Maureen Jennings. This was another wonderful panel providing insight into the strange process of adapting crime fiction work to film and television. Then it was time for another tradition. 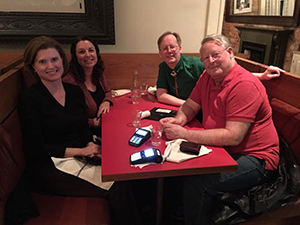 Michael and I had a lovely dinner with Judy Clemens (aka J. C. Lane) and Claire Booth at a delicious Italian restaurant called Terroni. It was one of the best meals of the vacation. It’s always nice to check up with these two friends. Back in time for the Opening Ceremonies where we could celebrate the excellent job that Janet Costello and Helen Nelson did organizing this Bouchercon, hear a bit about/from the Guests of Honor, and cheer on the deserving award winners in the first presentations of Bouchercon 2017. Next it was time for my final volunteering assignment at this year’s convention. I helped out with the book signing after the Opening Ceremonies. This event is always a joy – so many people, so many books. I was honored to help Alafair Burke by handing her copies of her forthcoming The Wife to sign while she focused on meeting and interacting with her fans. Everyone was so happy to receive books and The Wife is indeed one of my most anticipated upcoming reads. There were countless other excellent authors in that room, signing free copies of their books, so I know that the Bouchercon attendees were very happy campers that night. After a quick drink in the bar with Erin and Ann, it was again time for bed. As tempting as it is to stay up all night, I just know that for my own sanity, it’s best to keep to some level of schedule and getting to bed by midnight was a good goal – not always met. Fortunately, I was able to ease into the next morning. I had a breakfast meeting with Erica Neubauer – once again at Tim Horton’s (double yummmm). We talked about life, blogging, reviewing, and countless other things no one else would care about. It was a nice hour of companionship amidst the cacophony that is Bouchercon. I unexpectedly found myself in the Wartime and Crime Panel, but it was without a doubt one of the most fortuitous moments of this Bouchercon. As a huge fan of Charles (and Caroline) Todd, Susan Elia MacNeal, and Radha Vatsal, this was bound to be an enjoyable hour no matter what. But with another friend and supporter of BOLO Books, Holly West, moderating, it was all the more special. And she did a great job. This topic can feel overdone, but Holly made it fresh and the panelists – also including new-to-me John Lawton – were articulate, interesting, and thoroughly entertaining. This was a great panel! I could have gone to – and had planned to go to – several panels throughout the morning, but unfortunately never made it. 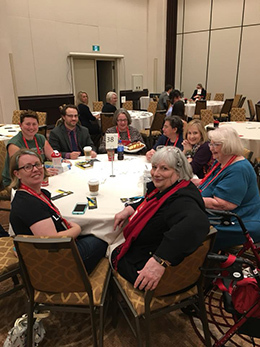 Running into folks in the halls of the hotel is one of the great joys of Bouchercon, so I found myself chit-chatting until it was time for the General Members Meeting. This was my first time attending the Meeting, but if won’t be the last. As an organization, everyone is invited to attend and the more folks that do so, the better Bouchercon will reflect the desires of the attendees. Every year, after the convention, complaints are posted online. This is fine, but if you are not doing something to make it better, take a look inwardly and make a change. Everything can be improved, but complaining won’t help unless you are willing to participate in the process of change. My next stop was the Librarian’s Tea. This year, the board opened the tea up to reviewers as well, which was very kind. It was a lovely event despite the fire alarm going off through virtually the entire afternoon. Hank Phillippi Ryan, who always carries herself with grace and composure, handled this intrusion with style and the panelists had fun with it. This helped to make lemonade out of lemons. My last panel of the day was the Guest of Honor interview with Megan Abbott conducted by Laurie R. King. These two women killed it. I have seen both good and bad one-on-one interviews and here Laurie was clearly well-prepared with relevant and interesting questions about Megan’s career. Megan did her part as well, opening up with candor and revealing herself fully to her fans (and future fans). I talked to one person afterwards who had not read Megan’s work and they were off to the bookroom to buy whatever they could! That is what Bouchercon is all about. After a quick bite to eat, I gathered with some friends in the lobby while the Noisy Auction was going on. This was followed by a dessert reception with tasty treats. Then it was time for the Pub Quiz hosted by the Crime Writers Canada. This was so much fun!!! We lost, but we did much better than we expected. 13 out of 20 points is not a bad showing. But again, the most important part was that we had fun. This was a new event for Bouchercon and by all accounts it was a success. What seemed like a less full day was no less exhausting. Bedtime. My first official panel of the day was one of the biggest events of this Bouchercon. The Best Novel Nominees in conversation with Hank Phillippi Ryan. Hank again shows just how prepared she always is – there is a reason she has won so many Emmy Awards for reporting. Megan Abbott, Reed Farrel Coleman, Chris Holm. Laura Lippman, and Louise Penny delighted the audience. Really folks, every book nominated this year was a winner, so if you haven’t read them all, you really should. This is the best of the best and it was an honor to be in the same room with so much talent. 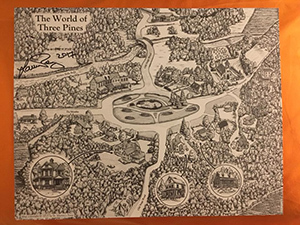 Afterwards, I was able to get Louise Penny to sign my map of Three Pines. This lovely map was part of a pre-order promotion in the United States a number of years ago and I have been waiting to get it signed so that I can frame it and display it in the home library. I next went to the Northern Crimes Panel. As followers of BOLO Books know, I am a huge fan of Nordic crime, so this panel was perfect for me. Of course, this was only after I broke a drinking glass trying to introduce myself to Rachel Greenaway – who was moderating. I follow the 7 Criminal Minds blog, so I wanted to say hi to Rachel. I did not, however, intend to create a scene. LOL. But we got it all cleaned up before the panel began, so no harm, no foul. Ragnar Jónasson is easily one of my favorite “new” writers. I’m not sure he can still be called new, but people are still discovering him, so I am going with it. Kelley Armstrong’s series is excellent, as is Caro Ramsay’s. I am looking forward to exploring the works of Alex Gray and Antti Tuomainen further. 2:30 brought about the panel I was moderating. Reading the Rainbow: The LGBTQ+ Panel. Thanks to my husband, Michael, for providing the decorations and giveaways for this panel. Jessie Chandler, John Copenhaver, Stephanie Gayle, Gerg Herren, Owen Laukkanen, and I had great fun discussing the evolution of the LGBTQ+ presence in crime fiction both behind and on the page. 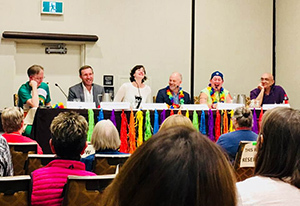 It was very gratifying that many folks came up to myself and the panelists throughout the rest of the weekend to tell us that the Reading the Rainbow Panel was their favorite of this Bouchercon. Frankly, with those panelists, all I had to do was show up and it would have been a success. But this is proof that prep work on both the moderator’s and panelist’s parts will make a panel shine. Thank you to everyone who attended our panel. We are glad that you enjoyed it. After a brief stop in the signing room to talk with some folks about BOLO Books, I headed off to two cocktail parties. St. Martin’s/Minotaur and Seventh Street Books both hosted wonderful events and it was nice to put some faces to the names of the publicists with whom I work on a constant basis. I was sad to miss the HarperCollins party earlier in the weekend, but I hear tell that this was a success as well. As bloggers it continues to be nice to see that publishers are aware of the value we bring to their authors and I just want to take this moment to say thank you to all the publishers with whom I work via BOLO Books! Dinner with Dru Ann and Nikki Bonanni capped off a near perfect day. BTW, Nikki, Margery Flax, Jay Stringer, and Chris Aldrich were all voted onto the board at the above-mentioned General Members Meeting, so rest assured that Bouchercon is in good hands for the future. 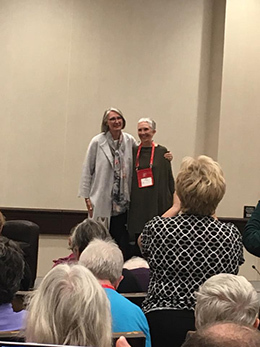 One cannot complain when Ann Cleeves is conducting the Guest of Honor Interview of Louise Penny. This was an entertaining conversation between two of the greats of our chosen genre. For those that were not able to be there, Louise did reveal that she has signed a new contract for more Gamache books. Her personal loss may mean a bit longer of a wait, but rest assured that more books are coming. Having that crowd celebrate Louise and her success was a true joy to behold. See you in St. Petersburg (not Russia! )–but I hope many times before. Thanks, Hank. Yes, writing these recaps always helps me to get over missing everyone. 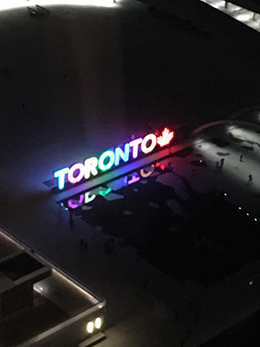 Doesn’t make me miss them less, but at least it helps me to remember what great times we had. I’ll certainly see you at Malice! And then again in St. Pete’s. One of the joys of reading this roundup is catching up on the panels I missed – just too much going on, too many people to catch up with! – but what a lovely surprise to see that you enjoyed the “Le femme cherche” panel so much! I credit Steve Steinbock, who suggested we gather for lunch beforehand. It really helped that we’d had a bit of time to get to know each other. I’m also thrilled that I got to meet you in real life. See you in St. Pete! it was a super panel. Whatever made it work, it certainly did. Of course, it helps that I loved the work of many of the panelists already. Dinner was wonderful. And I’m glad that we got to hang as often as we did. Not easy when there is so much going on. I was sorry to miss Bouchercon this year, but your recap made me feel almost like I was there. You’re right on in considering this a meeting of our tribe. Next year in St. Petersburg! I love reading about your journey through Bouchercon. Thank you again for being a wonderful moderator for the LGBTQ panel. I agree with you about the Wartime and Crime panel, the Best Novel Panel, and the Megan Abbott interview. Great moderators can do so much to make panels exciting and engaging. Apparently (if a bit accidentally) I made some great choices! You all were a wonderful group of authors to work with, so the panel was most definitely a joint success. I was more than happy to help launch your journey with Dodging and Burning. I am hoping for big things for this book and will do everything in my power to help it along. Hope to see you again soon! So glad to finally get to meet in person. You were a delightful breakfast companion! Love your blog and reviews on any day, but this was a perfect summary of Bouchercon. Everyone constantly business connecting and in our spare time hearing some excellent panels. My only regret was that your panel and mine were scheduled against each other. Also, can’t thank you enough for what you do for the SinC monitoring project. It was lovely having breakfast with you, Debra. You are very kind to say such things about the blog, it is really appreciated. As for the monitoring project – I’m happy to help with such a worthy cause. I hated missing Bouchercon this year, knowing how great it always is. Your recap let me walk through it and have a window into some special moments. Thank you! Man, I’m extra exhausted just reading about your weekend. I thought I was worn out (still) from my own Bouchercon adventures. It’s the best kind of exhaustion though. But yes, this one seemed unusually busy for me. Guess that’s a sign that the blog continues to gain popularity. 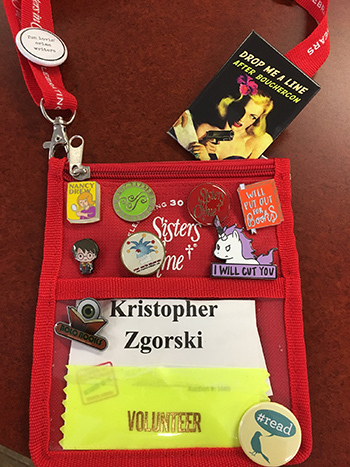 My goal for my first Bouchercon was learning more about writers and bloggers that I read and of course meeting them when possible. So attending LGBTQ panel was a must : learning about the journeys into their writing, the pros and cons , the changes and about their books interested me as I was not aware of the situation . You did a marvellous job and I wanted to tell you so when I went to collect my hug but I forgot and I ‘ m sorry for that. Bouchercon was all that I hoped for and more. Being surrounded by people so passionate about books : I’ m not alone, there are plenty like me. And all the new authors out there, it was so fascinating . I’ll be back. I am so thrilled that you enjoyed yourself, Danielle. It was lovely to meet you and I’m glad that you came back for that hug. Thank you for your kind words about the panel, the other panelists and I were thrilled with the turnout and are happy that so many people came away enjoying themselves. I look forward to seeing you at future Bouchercons.